After Tipperary had triumphed over Galway in the 2001 All-Ireland senior hurling final, signs with Mark 2:1 boldly emblazoned on them began to mushroom throughout the parish. Supporters were imitating the famous and ubiquitous John 3:7 banner that was to be seen at all the major G.A.A. matches as they proclaimed their pride in local hero Mark O’Leary. The boy from Beechwood had helped himself to 2-1 in Tipperary’s All-Ireland victory. The first green flag was a rocket of a shot to the roof of the net after taking a pass from Declan Ryan. The second was a poacher’s goal while his point was a trademark effort from way out on the right wing. Mark O’Leary is great grandson of George O’Leary (1844-1928), chairman of the Lahorna De Wets hurling club. Mark was born in 1977 and like his brothers George, Dermot, Stephen and Robbie he attended Kilruane National School. From an early age he showed himself to be very adept at the ancient game of hurling and it wasn’t long before he was wearing the famed black and white colours of Kilruane MacDonaghs. Success came quickly and in 1989 Mark was a prolific scorer for the U14 hurling team which took North and county honours. The following year he was a key member of the U14 team that won divisional and county championships and also reached the All-Ireland Féile final. The same season Mark was the star of the Kilruane School team which captured the North hurling and football titles. He had the honour of leading the hurling team to victory. In 1991 he won a North U16 hurling medal as Kilruane MacDonaghs got the better of Toomevara in the final. Mark soon came to the attention of the North Tipperary U16 hurling selectors and in 1993 he was a member of the divisional team that won the Munster final. He was also top scorer for the Kilruane MacDonaghs U21 hurling team that overcame Silvermines in the North ‘B’ final and went a step further by claiming the scalp of JK Brackens in the county decider in Moneygall. In both the drawn game and the replay Mark was the outstanding forward on the field. 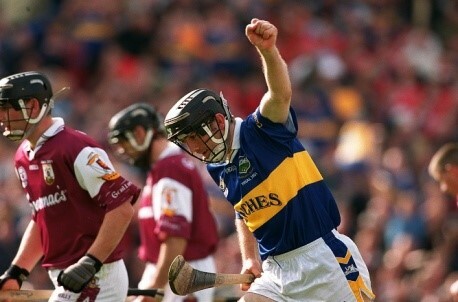 Liam Doran, in his Guardian report on the drawn encounter, lauded “the remarkable contribution of Mark O’Leary, still only sixteen, who contributed 1-9 of his side’s total.” In 1994 it came as no surprise to anyone when the Tipperary minor management came knocking on his door. The same season Mark made his debut for the Kilruane MacDonaghs senior team and he was introduced as a substitute in the North final defeat to Toomevara. The following year he wore the blue and gold once more for the Tipperary minors, but success eluded the Premier county. In 1996 he was the lynchpin of the Nenagh C.B.S. team which came up short in the Harty Cup final against St. Colman’s of Fermoy. Mark was no slouch at football and 1997 and 1998 saw him win divisional U21 B football medals with Kilruane MacDonaghs. He continued to impress for the county side and played U21 hurling with Tipperary in 1997 and 1998. Unfortunately, Cork thwarted Tipperary in two successive Munster finals. However, Mark had better luck with the Waterford Institute of Technology team that captured the prestigious Fitzgibbon Cup in 1999. His displays caught the eye of Tipperary senior manager Nicky English who called the Kilruane MacDonaghs star on to the Tipperary panel. Mark won a National League medal in 1999 and the following season he made his championship debut against Waterford. The start of the new millennium saw the Kilruane MacDonaghs senior team relegated. However, Mark received some compensation as he donned the blue of Munster to win the first of two successive Railway Cup medals. 2001 proved to be a memorable year for Mark. He won a National League medal early in the season. A Munster medal followed and in September Mark became the third Kilruane MacDonaghs player to win an All-Ireland senior medal when he scored two goals and one point as Tipperary defeated Galway to claim the Liam MacCarthy Cup in Croke Park. The Irish Independent rated his performance as follows: “Any forward who scores 2-1 from play knows that he has excelled. Both goals were well taken while his 63rd minute point was crucial.” He capped a brilliant campaign when he was selected as right half-forward on the All-Star team, the first Kilruane MacDonaghs player to receive this accolade. In 2002 he won a North intermediate league medal. The following year he was one of the driving forces on the Kilruane MacDonaghs intermediate team that regained senior status and he struck seven precious points in the unforgettable county final victory over Burgess in Nenagh. Since then major honours at senior level with the club have proved to be elusive and Mark had to be content with a division 1 county league medal in 2008 and an Ó Riain Cup medal in 2009. As the MacDonaghs seniors struggled to make significant impact on the championship, Mark turned his hand to management while still continuing his own playing career. In 2006 and 2007 he was manager of the Kilruane MacDonaghs U21 team which won successive divisional and county titles. Impressed by his record with the club, the county called on his services again and he was appointed Tipperary minor manager for 2009 and 2010. Mark continued to give his all in the black and white jersey without reaping any tangible reward. In 2012 he hung up his boots and a glittering career seemed to have come to an end. However, the break only whetted his appetite and in 2013 he returned to action again. Age had not dimmed his desire or dulled his determination to drive Kilruane MacDonaghs to the top. Although Toomevara pipped Kilruane MacDonaghs by a point in the championship, few will ever forget the rousing second half rally as Mark rolled back the years in a spectacular display of point scoring. The evergreen veteran fired over seven points from play, including six in a sizzling twenty minute spell. The year ended on a high note for Mark when he was a selector on the U21 team that retained its divisional title. Mark has been an outstanding ambassador for the club as a player and a coach. Modest to a fault he is the personification of sportsmanship, fearless in combat, leading by example through thick and thin. From his underage days his scoring exploits had marked him out as an outstanding player. Mark has earned the respect of friend and foe alike in a remarkable career. Consistency is the hallmark of greatness and over the last twenty years no more consistent player than Mark O’Leary pulled the black and white jersey over his shoulders. Fitzgibbon Cup (1); Ryan Cup (1); County intermediate (1); County U21 B hurling (1); North U21 ‘B’ hurling (1); North U21 ‘B’ football (2); North U16 hurling (1); County U14 hurling (2); North U14 hurling (3); North Primary School hurling (1); North Primary School football (1).